to the paragraph of the doctrine where the question and answer originated. 1] The Bible is the divinely-inspired Word of God, the repository of His plan of salvation and the record of His participation in history. The Bible is God's revelation of knowledge that man cannot discover for himself. It is the foundation of knowledge and the guidebook to life. The Old and New Testament comprise God's written Word which forms the basis of Christianity as taught by the Church and as practiced by the individual Christian. 8] Essential to the teaching of the Church is the fact that the Bible can be proved to be the written Word of God. The foremost proof that God's Word is precisely what it claims to be is that it works in one's life. The proof of obedience is the Bible's best stamp of divine authorship. Adherence to its principles, laws and concepts bring about success and happiness in one's own life, which is ultimately the most critical ratification of its divine inspiration. Only one who sincerely seeks to apply the biblical way to his own life will eventually learn that the practical instructions, timeless wisdom, spiritual depth and living laws come from a Supreme Being, and not merely from fallible, mortal men. Once a person has accepted the concept of the Bible containing the inspired word of God, he is able, by appreciating the intricate yet harmonious interaction of all parts of the Bible, to conclude in faith that the whole Bible, all scripture, is precisely what it claims to be-"inspired by God and profitable for teaching, for reproof, for correction, and for training in righteousness" (2 Tim. 3:16). 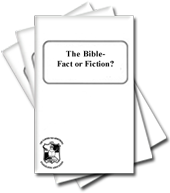 The Christian will also conclude that even those parts of the Bible which are by their very nature, unable to be "proven" in a mathematical or scientific sense (e.g., as yet unfulfilled prophecies or historical points which are unable to be substantiated by secular references) are indeed part of the Bible, form part of the vehicle of its message, and are accurate in their proper context. In this logical "jump"-this leap across undocumented gaps-one cannot discount the importance of faith. 15] The authors of the various biblical books came from differing backgrounds, lived in disparate environments and were diverse in their personalities, education and professions. They wrote in different styles, from different standpoints, to different audiences and at different times. Yet the continuing themes God inspired are the same. God used all their various and contrasting perspectives to shape and to emphasize the same basic truth. From Genesis to Revelation we read of the same God, the same massive plan being unfolded and developed, with each book augmenting, supporting and complementing that which has gone before. This unitary focus is due to the God who initiated, organized and inspired the entire Holy Scriptures. Although many different men played their part as they were moved by His Spirit (2 Pet. 1:20), the Bible is in reality God's Word and not man's. 18] There is a paradox in true biblical understanding. In order to properly understand any specific biblical doctrine, it is first necessary to comprehend the entirety of all biblical doctrines; and, of course, it is impossible to comprehend the entirety of all biblical doctrines until one understands all the specific biblical doctrines separately. Seldom can one biblical teaching be fully understood in isolation. There is an essential interdependence between nearly all biblical doctrines. Each must be understood in light of all the others. The reason for this is the inherent unity of the biblical focus and the coherent thread of its message. Proper biblical understanding must be achieved by visualizing and comprehending the full sweeping scope of its message that only the whole Bible can project. 20] One of the ways to begin to comprehend the unifying flow of the whole Bible is to follow its primary themes all the way through. Of all these, surely the most consistent, decisive and relevant is Jesus Christ. He, in essence, is the focal point of the entire Bible. He is the personality around whom everything revolves. Jesus Christ was the Creator of all things (Col. 1:16); the God of Abraham, Isaac and Jacob; the Rock of Israel as Messiah (Gen. 31:53; 2 Sam 23:3) and Lawgiver (Isa. 33:22), and exemplified throughout the New Testament as Savior and King. He is the Redeemer of all mankind, the supreme Lawgiver and consummate Teacher. He was the firstborn from the dead and is the Captain of our salvation, our constant intercessor and merciful High Priest. Jesus Christ is now the active head of God's Church and is prophesied throughout the entire Bible to return to earth as King of kings and Lord of lords to set up the Kingdom of God for all eternity. 25] Fifth, God has deliberately hidden much of His important truth from mankind so that the full progression, and eventually resolution, of human history would proceed according to God's timetable. As a result it is not man's fault that he doesn't understand the Bible. Even the prophets of old didn't always grasp the meaning of their own biblical statements (e.g. Dan. 12:8); and they surely didn't comprehend the fullness of the mystery of the purpose of human life (Matt. 13:17; Eph.3:4-5). Jesus Himself spoke in parables so that the common people would not understand what He was saying (Matt. 13:10-11); He was teaching His disciples not the masses (v. 10-1 7), since God's plan did not yet call for the vast majority of people to be called and converted. 31] 5. The biblical message is gained from the Bible as a whole, not from reading a verse or two in isolation or otherwise "proof-texting". What may seem to be a blanket statement in one passage can be greatly qualified elsewhere. The picture given by one book may be somewhat altered in the light of the teachings in another. One must perceive and comprehend the full spectrum of biblical doctrine in general in order to properly understand almost any specific element in particular. 32] 6. The resources of modem scholarship, properly handled, can add insight, detail and historical color to the basic biblical message. God has designed the Bible so that the essential message of God must be clear to any Spirit-led person seeking humbly to learn the plan of salvation as expressed in His Word. Indeed an uneducated Christian reading an inadequate translation will be able to understand the fundamental doctrines necessary for salvation. Nonetheless, a technical understanding of ancient languages, literature, history, society and other information put at our disposal by contemporary scholarship will enhance a person's total understanding of the Bible. The various books of the Bible were not written in a vacuum. To achieve a deeper understanding of their teachings, one must strive to grow in the knowledge of the history and background of the Bible, and the cultures in which they arose. Thus a Christian may add scholarly knowledge which can come only from God. This physical data will in turn embellish and enhance his spiritual understanding. 33] 7. Because of changed situations and society, there has to be some institution to clarify the meaning of the Bible for the Christian in the particular age in which he lives (Acts 8:31). Recognizing this need, Jesus Christ established and sustains His Church, to which He has given the responsibility to determine how to apply the Bible in particular situations in which the various individual Christians would not necessarily be unified. Even though the Bible always stands at the foundation of Christian belief, the Church can still come to decisions under the guidance of the Holy Spirit which were not specified in the pages of the Bible itself. For example, just as Moses modified the statutes and judgments of Israel for use in an agrarian society, and just as Paul made decisions that he did not learn from the Lord (e.g.. 1 Cor. 7:12), so the Church today must render judgments based on biblical laws and principles in order to keep itself relevant and vital in our modern age. 34] The essential element here is unity of the believers and coherence of the Church. Members of the Church must have a common body of beliefs, traditions, customs, practices and procedures in order to remain united. And this unity is vital if a collective work is to be done. A Christian in isolation will have to render his own judgments, and two such Christians will not always agree. But if we must have fellowship together (which God says we need for our spiritual development), if we must be in the same Church together (which God states is critical for our spiritual sustenance), and if we must accomplish a major work together (which is our collective, God-given commission), then God's government must be authorized to finalize doctrine, discern interpretations, administrate decisions, etc. And God's government can be established only by and through God's Church. 35] In summary, Christians should study the Bible diligently, respect it as the Word of God and seek its guidance through the inspiration of the Holy Spirit (John 14:26; 16:13) and the teachings of the Church. In order to become like God, we must seek to understand the Bible, which is the clearest expression of the mind of God. This we can only hope to achieve through profound and regular Bible study, and through the internalized implementation of its precepts and values.